1. In a large stockpot, add a couple cups of water and bring to boil. 2. Remove core from cabbage and very carefully peel off 10-12 leaves. 3. Place leaves in boiling water and turn off heat. 4. While cabbage leaves are softening, pan fry ground beef, onion, salt & pepper in cast iron skillet. 5. Once ground beef is cooked though, remove from heat and add crushed garlic. 6. With tongs, remove one cabbage leaf at a time, fill with beef mixture, roll tightly and lay in glass baking dish. 7. 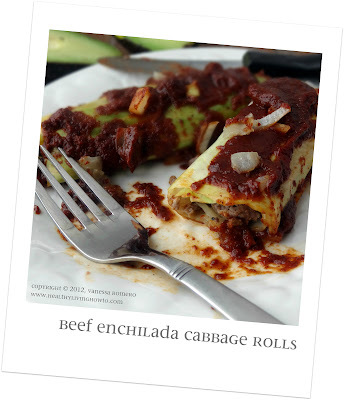 Cover cabbage rolls with enchilada sauce and bake at 350 for 20 minutes. 8. Serve with avocado slices and enjoy!